Go to our IG page. Now! Yep. Our very first SoniqStars contest! And we think we nailed it. Here’s why! As you may, or may not know, at first, we decided to test our Soniq Stars contest idea on Discord. This, as it turns out (and as we’ve clearly stated here), was a dumb idea. We aren’t afraid to admit this, because at the foundation of every successful business lies a graveyard of stupid, stupid, stupid ideas. Why? Because stupid ideas are the firmest material out there for a proverbial foundation — a concrete proof of what HASN’T worked. We’ve also publicly and transparently stated that we decided to move the whole Discord contest idea to Instagram. And we did! We’ve been busy doing it for the entirety of the past December and during the twilight month of 2018, we’ve learned so, so much. 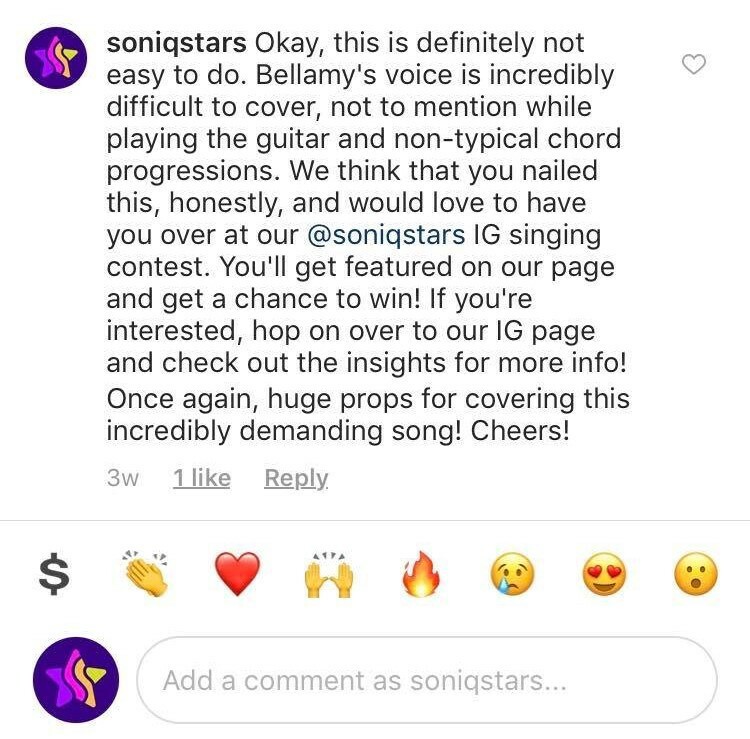 But first of all, we found out that the Instagram contest idea was nothing short of a major success, and we’re definitely not ashamed to say so, with almost 250 contestants to back this up. We created the @soniqstars IG page mid- to late-November and managed to pull around 240 contestants in about a month. More than 300 contestants applied! We’re not talking followers here, we’re talking people who were ready to join our contest. And who have done so! But how did we do this? Like any other now-successful company — by hand! Blood, sweat and tears were spilled. I, personally (although my team was of tremendous help here), was busy contacting potential contestants via Instagram. I’d search a singing-related hashtag (such as #singing), listen to people singing on their IG posts and send personalized comments to each and every one of them. I’m talking unique comments that spoke about exactly what caught my eye (or ear, in this case) with every particular potential contestant. As an active musician, I know what quality and skill mean and have made sure that my, well, let’s call them “leads”, were made aware that I wasn’t some Instagram bot spamming random messages to everyone, but a living person, who genuinely likes what they hear! By hand, I’ve personally contacted north of 1,000 musicians on Instagram! This, again, might not seem like that big of a deal, but when you take into account the fact that every single comment was personalized and preceded by watching every single one of these videos start-to-finish, that adds up to a lot of hours. Why am I bragging? Well, because I’m awesome, really. But more importantly, because this is the exact culture we nurture here at Soniq. As a community manager, I’m well-aware of the fact that I represent the face of Soniq, and a face representing a team with so much potential and love for music needs to show readiness to grind and grind and grind for hours and days and weeks, in addition to being, ya know, pretty. related singing contest in a single month is a lot! The music community doesn’t really trust the crypto world yet and we’ve managed to convince them otherwise through sheer tenacity, honesty, transparency and willpower. This, is another important mission that Soniq aims toaccomplish. Additionally, out of approximately (but more than) 1,000 musicians contacted, almost 250 have actually joined the contest. This is a ~25% turnover! This is nothing short of impressive. 24o singers, 200,000 video views, 100,000 people reached. Amazing stuff, really! this contest has brought us exposure. More exposure for us means more exposure for the musicians. The one thing that we’ve learned from our first IG contest is that getting paid isn’t the only problem the musicians face — getting exposure is just as important and heavily intertwined here. Also, keep in mind that these 240 contestants were singers, exclusively. We felt like the broadest musical instrument that are the vocal cords would work best for our contest. Now imagine how many guitarists, bassists, drummers, etc. there are out there! Was the contest a success? Although it has brought us valuable exposure and helped us push the SONIQ volume and price a bit forward, there is a more important, lowkey benefit here. Our contestants were open about accepting their SONIQ rewards. The main goal of this IG contest was testing the business model for our upcoming first product — the Soniq Stars Contest app. Seeing as how the musicians that participated in our contest clearly trust us, the test results were successful — musicians are more than happy with participating in a music crypto contest. What’s next? Well, the two remaining groups that require testing are the Judges and Sponsors. Stay tuned and check out our SoniqStars IG page! Decentralized platform that provides solutions for musicians world-wide.